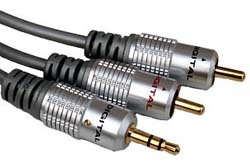 A High Quality 20m 3.5mm Jack Plug to 2x phono cable. A high quality flat Cable Scart Lead with metal bodied connectors and gold plated contacts. All 21 pins connected with individually screened OFC cable to provide the ultimate picture and sound quality. Ideal for interconnection of VCRs, satellite receivers, digi boxes & DVD players to televisions etc.